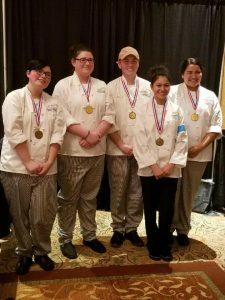 Albuquerque, New Mexico – March 5, 2018 – The Hospitality Industry Education Foundation (HIEF) has announced the winners from the 16th Annual New Mexico ProStart Invitational. 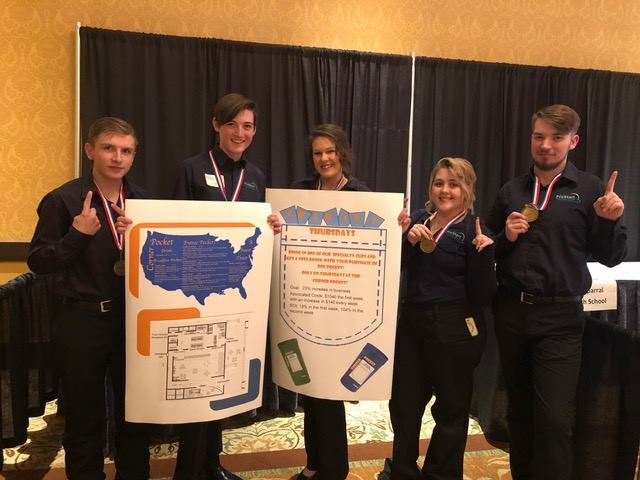 Deming High School Culinary Team and Cloudcroft High School Management Team will be on their way to Nationals this April in Providence, Rhode Island. The teams will compete against other state winners from across the country for their chance to win the title of National Champions! The two teams competed for their titles on March 5th at the New Mexico ProStart Invitational held on March 5, 2018 at Crowne Plaza Albuquerque. It was an action-packed day! 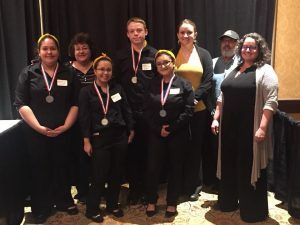 Deming’s Culinary team cooked up a three-course meal in 60 minutes using only two butane burners and no access to electricity or running water. Their menu included an appetizer of pan fried quail eggs with dressed cabbage and spinach with pancetta and pickled sweet potato. Their entree was pan seared and smoked quail with farro pilaf and sautéed zucchini and yellow squash with a port reduction. Dessert followed, including poached pear dipped in chocolate, encrusted with Granola, and accompanied by a mixed berry coulis and Chantilly cream. Cloudcroft’s Management team developed a restaurant concept from start to finish, including marketing, costing, and menu planning. Their restaurant, “The Corner Pocket” is a quick serve, artsy but comfortable restaurant serving up comforting food “pockets”, fluffy crusts filled with meat, vegetables, or sweets meant for a delicious, easy to eat, on the go meal. Their custom concept was judged by professional managers, chefs, and restaurant owners from across New Mexico. Taos High School took home the 2nd Place Culinary win, 3rd Place Management win, and the Hospitality Cup! The Hospitality Cup is awarded to the team with the highest combined scores in both Management and Culinary Competitions. Other teams that competed were: Alamogordo, Atrisco Heritage, Chaparral, Clovis, Espanola, Gadsden, Questa, Rio Rancho, and Ruidoso. NMRA and HIEF are so proud of all teams for their hard work and dedication! 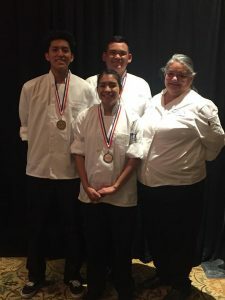 Almost $1 million in scholarships were awarded to the first, second, and third place winning teams from the following: New Mexico State University, The International Culinary Schools at the Art Institutes, Escoffier School of Culinary Arts, Culinary Institute of America, Johnson and Wales, Kendall College, and Culinary Institutes in Louisiana, New England, and Virginia. 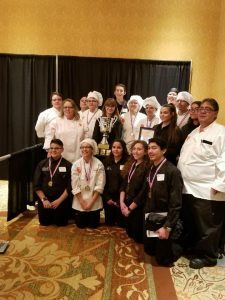 Brianna Dennis, the Education Director of the New Mexico Restaurant Association is no stranger to the ProStart program. She began judging in 2014 and has been proactive in the ProStart scene ever since. “It is so very exciting that these students, interested in Culinary and Management careers get to experience ProStart in high school, and that they get the opportunity to show off the skills they’ve learned at both State and National competition levels”, exclaims Ms. Dennis. 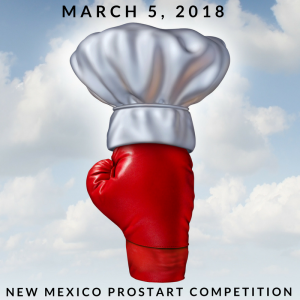 In the 2017-2018 academic year, the New Mexico Restaurant Association is working with over 34 high schools across the state to introduce over 1800 students to career opportunities in the restaurant and hospitality foodservice industries through the ProStart program. 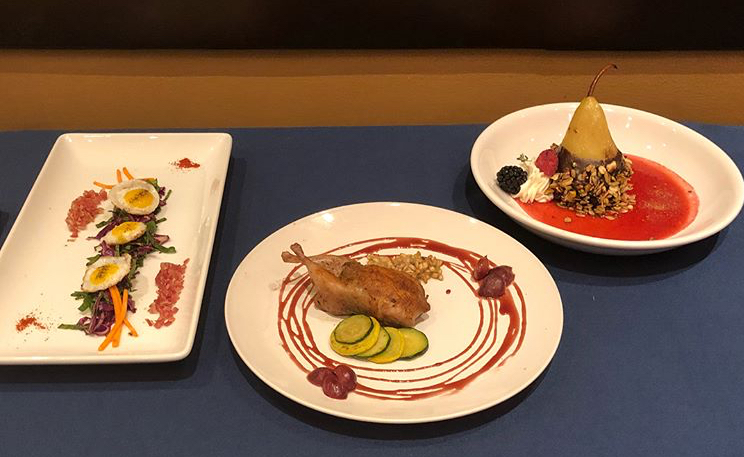 Nationally, ProStart is taught in more than 1800 schools and reaches nearly 140,000 students in the United States, Guam and Department of Defense Education Activity schools in Europe and Asia. ProStart is a two-year educational program supported by the National Restaurant Association Educational Foundation in partnership with state restaurant associations. 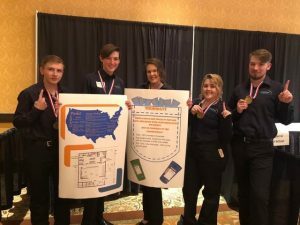 The career-building program blends classroom learning with mentored work experience to teach high school students the management and culinary skills needed for a career in the restaurant and foodservice industry. When students meet academic standards, complete a checklist of competencies, and work at least 400 hours in the industry, they are awarded the ProStart National Certificate of Achievement that signifies they are well qualified to enter the industry workforce For more information on the New Mexico ProStart program, visit https://www.nmrestaurants.org/prostart-program/ or find us on Facebook or Twitter. ProStart teaches the culinary and management skills required by the nation’s restaurant, hospitality and foodservice employers. This is achieved through the curriculum – Foundations of Restaurant Management and Culinary Arts – developed in partnership with the industry. With total restaurant and foodservice employment projected to grow by 11% over the next 10 years, the New Mexico Restaurant Association is committed to ensuring the development of a highly-trained and professional talent pool through scholarships and educational programs. The New Mexico Restaurant Association’s mission is to empower the food and beverage industry by promoting and protecting common values and interests. It has more than 1,000 members in 111 cities all over New Mexico, who join together for meetings, seminars and the hospitality industry awards to honor the industry’s top achievers. It has actively represented and promoted the food service industry in New Mexico since 1946. For more information on NMRA, visit nmrestaurants.org. 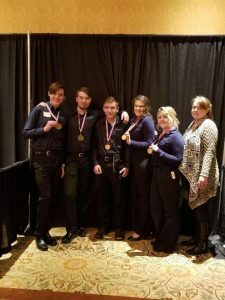 The Hospitality Industry Education Foundation (HIEF) is a not-for-profit organization dedicated to fulfilling the educational mission of the New Mexico Restaurant Association. In addition to administering the ProStart Program, HIEF awards scholarships to students pursuing a degree in the hospitality industry. To learn more about HIEF programs call 1-800-432-0740. As the philanthropic foundation of the National Restaurant Association, the NRAEF exists to enhance the restaurant industry’s service to the public through education, community engagement and promotion of career opportunities. The NRAEF works to attract, develop and retain a career-oriented professional workforce for the restaurant industry. The restaurant and foodservice industry comprises 980,000 restaurant and foodservice outlets and a workforce of more than 13 million employees, making it one of the nation’s largest employers. For more information on the NRAEF, visit NRAEF.org.